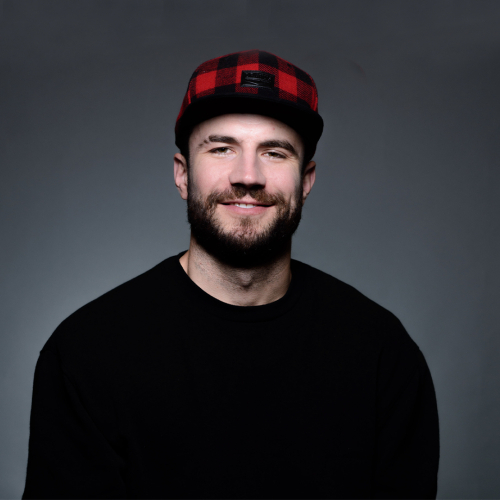 Sam Lowry Hunt (born December 8, 1984 in Cedartown, Georgia, United States) is an American country singer, songwriter and former college football player. He is known for writing singles for Kenny Chesney, Keith Urban, and Billy Currington. In 2014, Hunt signed with MCA Nashville and released his debut album "Montevallo", which includes the number 1 Country Airplay hits "Leave The Night On" and "Take Your Time". Sam Hunt co-wrote Kenny Chesney's 2012 hit "Come Over", for which he received an ASCAP award. He also wrote two singles released in 2014: Keith Urban's "Cop Car" and Billy Currington's "We Are Tonight". Hunt independently released the single "Raised on It" in September 2013 and in October 2013 he released via his website a free 15-song mixtape titled "Between the Pines". In January 2014, it was confirmed that he had signed with MCA Nashville. On August 12, 2014, he released "X2C", a four song EP, intended as a preview of his first studio album. The EP debuted at number 36 on the Billboard 200 and number 5 on Billboard's Top Country Albums chart, selling 8,000 copies in its first week. Hunt's first single for MCA was "Leave The Night On", which went to number 1 on Country Airplay in October 2014 and received a platinum certification by the Recording Industry Association of America (RIAA) for one million certified downloads.His first full-length studio album, "Montevallo", was released on October 27. The album included his own version of "Cop Car". On November 5, 2014, Montevallo debuted at number 1 on Top Country Albums and number 3 on the Billboard 200. It opened with 70,000 units sold. Five days later, he announced his first tour, Lipstick Graffiti. Tickets went on sale Friday, November 14. Within minutes--and in some cases seconds--of going on sale, the tour sold out at 15 of the venues. In 2015 he served as the opening act for Lady Antebellum's Wheels Up tour.